The design of this Large TV Stand was inspired from lodge style furnishings. With a simplified silhouette, cleaner lines and refined details, it makes a grand presence that’s far from overwhelming. Rich elements include a dark coffee-tone finish and shelved cabinet storage with a diamond shaped metal mesh door for a uniquely curated look. 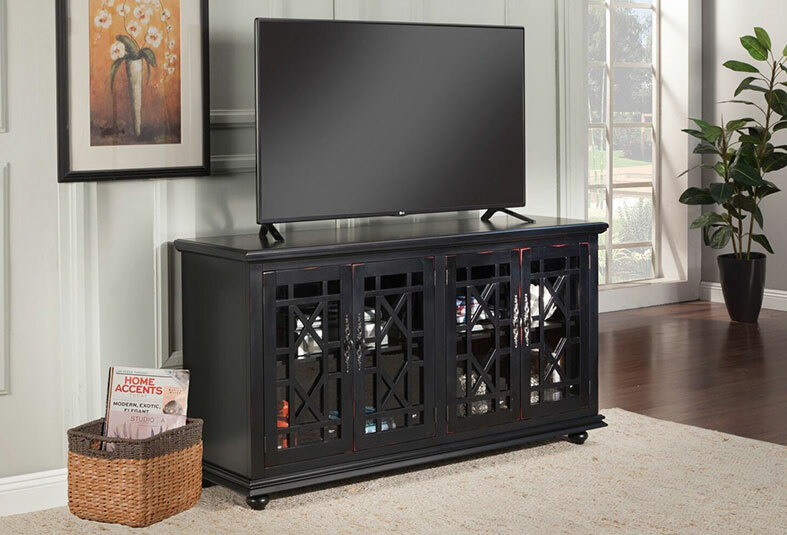 Add a rich and traditional furniture set to the living room in your home today, with the Entertainment TV Stand. Well-built, and constructed of hardwood solids with Cherry and Walnut burl veneers, this collection is a lasting group of furniture. The vintage Cherry finish is a warm and inviting choice, and adds a gorgeous aesthetic to your home. Provide a gorgeous centerpiece for your home entertainment with this TV stand. Crafted from high grade wood, with a durable laminate finish that features 4 open shelves for ample storage space, with a cable management system to help you maintain a tidy appearance. Elegance and function are combined in this wood TV stand for a striking appearance. It features ample media storage and three tempered safety glass panes for a traditional look. If you're looking for that extra something to enhance the décor of your living area, then look no further than the W100-01 has LED technology and remote control with LED display. With a realistic wood burning flame effect combined with life-like logs, this insert adds fashionable function to any home. Make this Large 59-inch TV stand the center of attention with its popular urban eclectic style and functionality. Featuring a rustic finish over a replicated pine grain creates an authentic natural look for your home entertainment area. You'll love its functionality: a spacious drawer, open cubby and adjustable shelf easily accommodate your media needs. Cutouts keep wires out of sight and provide ventilation. Sold separately, an electric fireplace can easily be installed on the right-facing side.